Indigenous peoples represent 1.5 percent of the Sylhet Division population, and are scattered and disunited in preserving their traditional and cultural practices. 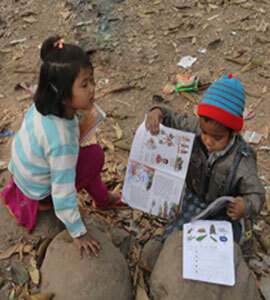 They are very poor and have little opportunity to improve their socio-economic condition. In most cases they are disadvantaged due to fundamental and basic problems such as lack of access to safe water and sanitation, health facilities, education and opportunities of employment. Welcome to the website of Ethnic Community Development Organization (ECDO). ECDO is a non-government and not-for-profit voluntary organization working for the development of different indigenous communities in Sylhet Division, the northeastern corner of Bangladesh. Our aim is to ensure the realization of equality and empowerment amongst indigenous peoples and to eliminate the discrimination against these communities from mainstream society. ECDO has extremely good links with the leaders of local indigenous communities, and as we are indigenous people ourselves, ECDO benefits from having a unique link and bond of trust with its target beneficiaries, and thus greater access in to indigenous communities than might be enjoyed by other, non-indigenous organizations. We utilize this advantage by involving the communities as much as possible in all decision-making processes, and we operate a right-based approach to development. Our philosophy is to utilize everything from high-quality academic research to regular open-forum discussions in villages to try to understand the situation and needs of the indigenous people, and we always attempt to make their analyses as participatory as possible, to ensure a sense of community empowerment, ownership, and long-term sustainability to the projects. From its inception, ECDO has formed its mission and vision from the opinions and needs of the indigenous people themselves. ECDO’s mission is to assist indigenous communities in working for a positive and sustainable change for those deprived of rights and opportunities by implementing both service delivery and rights based approaches. ECDO implements its activities in a fully participatory and bottom-up approach with an emphasis on empowerment from within indigenous communities. ECDO envisages a society where empowered, educated, aware and culturally diverse indigenous groups are able to ensure their own human development free from discrimination, poverty and exploitation.